[REVIEW 2019] What Are The Best Cappuccino Makers To Get? Ever feel like you want a barista style cappuccino at home? Well now you can. With some espresso machines you have the option to make not just espressos but cappuccinos too. 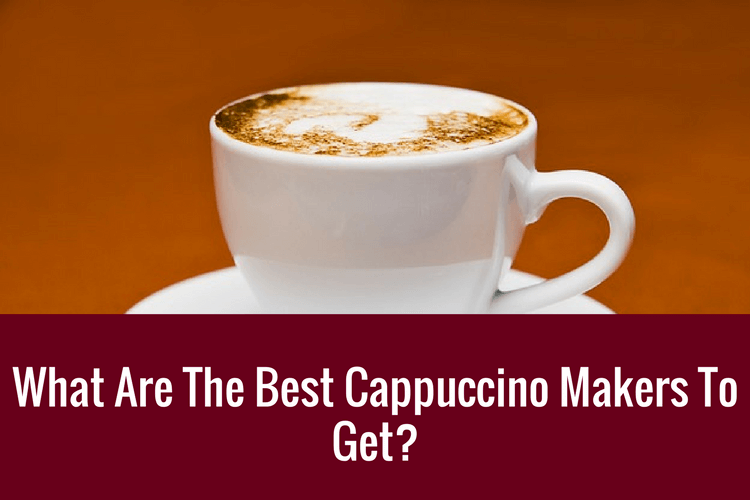 Lets help you find the best cappuccino machine to make that drink. We will help you to see which machine you should probably start with as well. A good cup should taste rich, bold and flavorful. It should also taste slightly sweet from the milk. Some variations of the cappuccino might taste very sweet as sugar or syrups are added to it. Cappuccini Chiaro. This is a lighter version of the drink and are made up with more milk. This type is creamier and taste close to a Cafe Latte. Cappuccini Scurro. This is the heavier version of the drink and made with less milk than espresso. This drink is relatively heavier on the tastebud and stronger. Flavoured Cappuccino. This is more popular in the States. Flavoring or syrups are added into the drink, making it the sweetest out of the types. Chocolates can be also sprinkled on top of the foam for extra taste and nicer aesthetics. Want to know more? Take a look at this. If you are looking to make amazing drinks above, you should probably check these out! This machine by De’Longhi uses NESCAFÉ pods to make the coffee. It is a compact machine with a built in water tank that holds 45 ounces of water to help brew the coffee. Not only does it make cappuccinos but you can make over 20 types of coffee using pods. As it is quite a compact machine, you can place this anywhere in your kitchen in reach of a plug socket. The coffee itself is exceptional in comparison to other machines, and with the range of coffee you can try, you will never get bored. Your coffee will be ready in minutes and to an excellent standard using the 15-bar pressure regulator to help regulate the coffee and steam the milk to barista quality. Though, some machines sometimes do have the issue of breaking down and stop working after a few months. This can be quite a downer but with a 2 year warranty you can simply replace your machine. The all in one machine also means you don’t need to fiddle around with grinding your beans and steaming your milk to enjoy your fresh coffee allowing you to sit back and relax while your machine does all the work for you. With the pods being self-contained, there is limited mess meaning you will be able to spend more time cleaning up and more time enjoying a frothy cappuccino. The 3 in 1 espresso machine allows you to make cappuccinos and lattes. With a built in water tank and milk steamer, coffee has never been easier to make. This machine is ETL certified, meaning it is built to the highest quality so don’t be worried. The built in milk frother makes making a cappuccino easy although the suction on the milk tank can be too stiff, requiring some effort on your part to get it off and on. You might need to spend some time getting the machine up and running as the instructions can be hard to understand at some points. Do note that the milk for the cappuccinos might not always heat properly. This is a concern that you should be duly aware of as the frothy milk should be hotter than the coffee. Despite of the slight shortcoming, the machine is compact with limited mess as the machine is very self-contained. The coffee stand, where you rest your mug, is adjustable so you will be able to change cup depending on your coffee preference. The parts of the machine are made well, the sleek finish is backed up with a sturdy exterior that will hold up against general wear. Finally, the pods that come with the machine make coffee making even easier as you just pop them in the machine and press a button. This machine only works with K-cups. Within minutes you will be enjoying your cappuccino without having to lift a finger. This automatic espresso machine with built in cappuccino maker would make an excellent addition to any coffee lovers’ life. The integrated grinder with adjustable settings ground your beans for you consistently every time. You can also use your own pre-ground coffee if you wishes to. A sudden decaf fix? you have it! This machine also boasts a “system” that frothes your milk for you. Though the only manual work needed from you is to place the container with milk under the nozzle and select the settings. If you have friends round for coffee, don’t worry, this machine doesn’t cool down between coffees so your friends will be able to enjoy high quality cappuccinos to the temperature that is right for them. With a large bean holder you will not have to change is as often as with some machines, and is easy to remove and fill up when necessary. As an easy to clean machine, you will just have to clean out the brew unit that is inside and wash it out, preparing your cappuccino without having to clean up loads afterwards. Ever product have a few shortcomings. This model water holder is a bit small so when making different coffees you may need to refill it often when making cappuccinos. The sleek and innovative design of this machine reflects the quality of coffee that is produced. The built in milk steamer helps you to make your own frothy milk and decanting it onto your coffee, making you feel like a real barista. With the built in 15 bar pump, you can enjoy cappuccinos at home quickly and to a delicious standard. You might experience some hiccups with the machines after a couple months. The good thing is that their customer service team are extremely helpful. Which is a plus nevertheless. The machine takes little effort to master and in no time you could be making cappuccinos to the highest standard. You can enjoy the frothiness of your own creation within minutes of pushing a button. This Hamilton Beach espresso machine with built in steamer for cappuccinos uses ground coffee and pods to prepare barista quality coffee. The steamer allows you to make a cappuccino easily and without making a huge mess and the ground coffee gives you an authentic tasting coffee in minutes. Two coffee sprouts instead of one means that you can make multiple coffees at once, leaving you with more time to enjoy your cappuccino or desired drink. The easily removable water tank lets you fill it up when it is needed meaning you don’t need to mess around anymore. The water tank itself might leak though for some people so sometimes you may need to alter the seal to stop this from happening. Otherwise, this could lead to you having to clear up water from time to time as the seal can loosen. The machine itself is a sleek design with a black and stainless steel finish so you do not need to look around to fit it in with the color scheme in your kitchen as it will fit in almost anywhere. There are different types of machines out there, but which one is the one for you? The De’Longhi NESCAFÉ Dolce Gusto Genio is an exceptional machine that would suit anyone. It is compact and easy to use so you don’t need to learn any complicated maneuvers to get your cappuccino. The pods it uses are handy and you just have to put them in the machine, press a button and wait for your fresh cup of coffee to brew. The fact it uses NESCAFÉ branded pods means that you’re in safe hands as they are one of the world’s leading coffee manufacturers and you know it’s going to taste great. The automatic steamer allows you to enjoy great tasting cappuccinos without having the mess, everything is done for you and you just have to wait for it to come out of the machine. Overall, this machine would strike you as an easy to use, great looking cappuccino maker.